Transplanting your own fat eliminates the potential complications seen with dermal fillers such as reactions to foreign material or allergies, and the results can potentially last up to ten years or more. Especially for people who require multiple syringes of dermal fillers to achieve their desired results, fat grafting can be a less expensive option, with potentially longer lasting results. Until recently, the goal of fat transfers was to transfer intact, living fat cells from one area to another and hope that they'd survive to provide long lasting volume. In the last couple of years, studies have shown that most transferred fat cells die, regardless of how carefully they're transferred, but stem cells and healing factors, which are abundant in fat, are activated by even minor injuries, such as the injections themselves. Activated stem cells from fat and bone marrow have the potential to become fat cells, muscle cells and bone, which are the exact tissues that shrink in the aging face to cause overall volume loss. Since the stem cells and healing substances that produce the results are much smaller cells and molecules than fat cells, we can use much smaller cannulas or needles to harvest them than when we were trying not to rupture the fat cells we were transferring. Because nanofat can be injected through a thin needle near the skin's surface, it can be used directly in or below the skin, where a fat transfer would have looked lumpy. Theoretically, nanofat injected just below the surface should improve crepey skin or skin that's lost elasticty. One of the most common concerns that our patients complain about is crepey skin on the neck. It's not just the thin skin on the neck that becomes crepey, it's the paper-thin muscle attached just underneath the skin that gets loose and buckles the overlying skin. Very few nonsurgical treatments help with crepey neck skin and the neck is often a giveaway on a person's age. 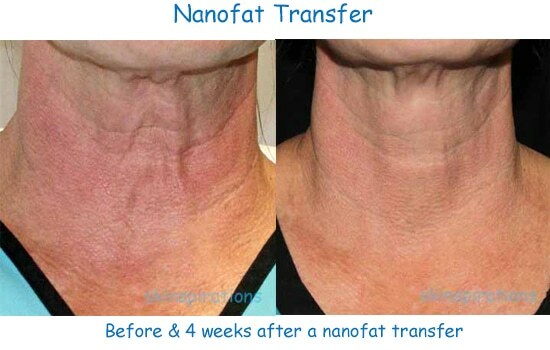 To test out the theory that nanofat may improve both the muscle and the skin, I withdrew a little of my own abdominal fat 4 weeks ago, filtered it, & then injected it into my crepey neck. Luckily, because I've been interested in stem cells from fat for the last few years, I had the discipline to avoid our CoolSculpting devices, who must have been dying to get their applicators on me. Results improve over a few months after treatment but at the bottom of the page are my before & after photos at 4 weeks out. What's involved in a fat transfer or nanofat injection? People interested in having a fat grafting treatment need to have a consultation (complimentary) with Dr. Elliott first to determine if they're a good candidate, and discuss the procedure. Heavy smokers, patients on anticoagulants (blood thinners), people with poorly controlled medical problems or who have body dysmorphic disorder, are not eligible for the treatment. A minimal amount of fat is harvested unless it's going to be banked, so this is not a treatment that will produce body contouring. On the day of the treatment, Dr. Elliott gently applies anesthetic and then painlessly removes some fat with a microcannula. The fat is washed or emulsified, and then meticulously injected into the areas where volume is desired. The area from where the fat was harvested is usually minimally tender for a few days after the procedure, unless larger amounts of fat are obtained for banking. Facial bruising and swelling can vary from none, with nanofat injections, to moderate, with a full fat transfer, varying of course among individuals. Patients can usually return to social and work activities immediately after nanofat injections, and within about three days, with full fat transfers. What are potential problems or complications with fat transfer? Every patient reacts differently and occasionally people will have no improvement or less than the desired results.Like any procedure utilizing injections, complications can include bleeding and bruising at the harvesting or injecting sites, depressions at the site where fat is harvested, and post-treatment infections are a rare but potentially serious complication. As with dermal fillers, over-correction and under-correction at the site the fat is transferred can occur. Since transferred fat may last for years, over-correction can only be corrected by removing it surgically. Why do I not recommend fat transfers for everyone interested in volume replacement? 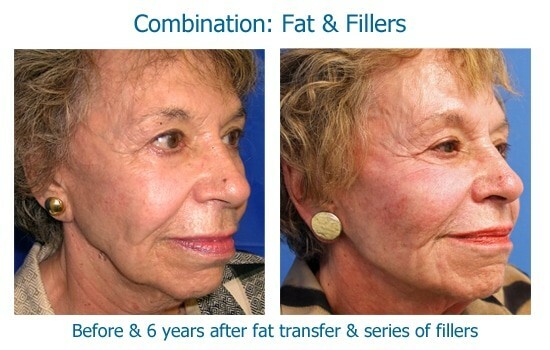 The duration of volumizing results from a fat transfer are more unpredictable than the results seen with dermal fillers, and if a patient doesn't accept that they may need to have at least one repeat fat grafting treatment a few months after the first, I recommend they stay with dermal filler treatments. Some people maintain the volume that the fat restored for over ten years and some people lose all of their improvement in less than three months. It's impossible to predict who will get the best results with fat grafting, so patients not willing to do a touch-up fat transfer procedure if needed, should probably choose a different treatment option..
Because of the "liquid gold" potential in fat for future regenerative or rejuvenating treatments, removing larger quantities of fat and storing them is an excellent choice. Medical trials around the world are revealing the multiple medical uses for healing substances found in fat, even after it's been frozen, and the regenerative cells derived from fat are a type of "bio-insurance" that may be important in treating your future diseases or injuries. Read more to learn about storing fat for future use. Fat grafting, fat harvesting for banking, and nanofat treatment fees range from $850 to $2,500, depending on the type of treatment and the size of the area. Call our office at 727-571-1923 today or click here to make an appointment for a complimentary initial consultation, to learn if a fat treatment is your best option.